The other day I was thinking about the life I was living in 1969, which is something I seem to do a lot. I imagine that particular year fascinates me because of my unnatural immersion in the world of aviation that existed for me then. For several reasons, there was almost nothing other than aviation that I had contact with during this particular year. The outside world that year had almost ceased to exist for me, and my life was entirely revolving around things aeronautical. I was living at the airport, I had no car and my only personal contacts were with people that were in one way or another involved in aviation. To say I was focused on my career would be an understatement. In subsequent years I got a car, met a few people that didn't fly, traveled a bit other than in an airplane and began to develop an interest in a few things outside of aviation. In terms of being a one note Samba, 1969 remains unique in my life. Anyway in my latest drift down that particular river, I remembered that the summer of 1969 marked the first of the many trips I was to make to the big EAA fly in, which in those days was simply referred to as 'Oshkosh.' As I thought more and more about that pilgrimage and the subsequent flight, murky and embarrassing details began to emerge from the mists of time, much like the wrong end of the runway swimming out of the murk during a low approach. This milestone I recalled, would fulfill a long time yen to witness firsthand the sights and wonders of the big convention that I'd only read about in the aviation magazines. Better still, four of my students, all of whom I had infected with 'Oshkosh Fever', would accompany me to the big event and we had started planning and outfitting for the trip weeks before. And so it was that a bright summer afternoon saw the five of us, packed like sweaty sardines into the Cherokee Six alongside camping gear for a week's stay and a miniature motorcycle, winging northwest toward all the excitement. After prudently circling the confusion of Chicago and the liquidity of Lake Michigan I flew off the Chicago chart and reached in my flight case for the Green Bay. Hmm, it's not there. Calmly I explained to my students that this could be a bit sticky for someone less experienced than their feckless captain, and should it ever happen to them they should turn around immediately, fly back onto the chart they just left, find an airport and purchase a chart. However, I modestly stated, in view of the navigational capabilities possessed by yours truly, I would reach into my bag of tricks and find us a solution that would not delay our arrival at Oshkosh. Suitably awed, four innocent heads nodded approval of my plan. I switched on the ADF and started listening for the Oshkosh AM radio station. Not having a frequency for the station, I knew I would have to identify it by the advertisements for the local businesses that were being aired. Soon I found it, strong and clear with one commercial after another, touting Oshkosh merchants of all stripes. I switched the ADF to point and the needle swung directly toward the nose. I nodded knowingly to my students. Oshkosh coming up I smirked. My students smiled their satisfaction at the steady hand controlling their fate. Soon an airport appeared out of the summer haze, dead ahead and almost exactly where the ADF was pointing, the runway perfectly aligned to the 36 that I knew Oshkosh to have. I did have the frequency of the tower, thanks to a handout the EAA had sent and I dialed in and called Oshkosh and received an immediate response. I reported eight miles south, airport in sight and they asked me to report five out. At five miles from the airport I reported and was told I was not in sight and to make a straight in for runway 36, report two mile final. As I drew nearer I was surprised at the dearth of aircraft parked there. I expected to see hundreds of them, and while there were quite a few, there weren't the numbers I was expecting. Well, it is early in the week and the crowds probably come later. I reported a two mile final for 36 and a weakened response from the tower advised me that I still wasn't in sight, but I was cleared to land, report short final. On short final I dutifully reported, pulled the throttle and flared, just as the barely audible response came from the tower. 'We don't have you, are you sure you're landing Oshkosh?' Then their transmission faded completely and the realization of what I had done swept over me. Fond du Lac, Wisconsin had one more operation that day than they had radio contacts and I was the idiot of the moment. As I poured the power on and climbed out, a flush of heat climbed my neck and I shrank to half the size of my previous persona under the incredulous looks from my students. There are just no words for occasions like this. Of course with five witnesses to my incredible faux pas, only one of whom couldn't wait to get back to our airport to tell everyone they ever knew about it, I achieved a tolerable amount of fame during the next few months. Even more unfortunately one of my students wrote a song about the sad affair and it gained a spot on the top ten that summer, at least at the airport. At any rate, we eventually landed at Oshkosh and there parked all over the airport, were the airplanes that had been missing at Fond du Lac. With tents pitched and the Six tied down, we combed the grounds to explore the aircraft and the displays and to watch the landing traffic as it arrived in a steady stream. We all agreed that it was unlike anything we'd ever seen and in spite of our spirited sightseeing it took several days to visit everything. Our little motorcycle proved quite handy for trips to town for provisions, but miniature motorcycles were not licensed for the road in Wisconsin, and ours made quite a stir. I recall one store keeper looking out at the tiny machine parked in front, asking if it had shrunk after being left out in the rain. 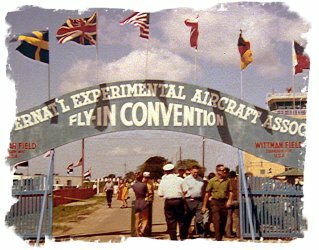 If memory serves me right, this was the year that the EAA first moved the convention to Oshkosh from Rockford, Illinois and we found very rude facilities with none of the polished appearance that the convention boasts now. The grounds were very rough and small rocks dotted the fields everywhere. I recall how impressed I was with the solution that the association used to take care of the rock problem. Throughout the week there were periodic announcements which asked each and every person to bend over right then, pick up a rock and deposit it on one of the rapidly growing piles. When this occurred, as far as you could see people were bending as one, remindful of the faithful facing Mecca. It was fascinating to witness the power of numbers at work and by week's end almost all of the rocks were stacked in neat piles all over the grounds. In spite of my humiliation at Fond du Lac, it was a wonderful experience all in all, and I remember it fondly. I loved sleeping out under the stars, surrounded by hundreds of airplanes, drifting gently off with the sound in my ears of an aircraft engine running up somewhere.